Yesterday I had a day where everything went so wrong in the kitchen that I wanted to stab a fork in somebody’s eye. I was taken over with Kitchen Rage. My blog is called Tales of the Tiny Kitchen because that’s what I have: my kitchen is minuscule, and the problem is worsened because my husband and I are total gourmand foodies and own just about every single bit of kitchen kit known to man* – every time you want to take something out of the oven and set it down, you either have to put it on the floor or lift up a very heavy juicer off the work surface and put it down in its place. Every square inch of worktop or cupboard is bursting full. We are thinking of starting to hoist kitchen implements from the ceiling. And the luxury of owning a dishwasher (I have dreams about this) is totally off the cards – one handyman came to look and see if anything could be done, and bar blocking out the only window or building outwards into next door’s flat, there is nothing to be done. Anyway, yesterday I had planned a lovely day’s baking and relaxation, after a mammothly stressful week at work. 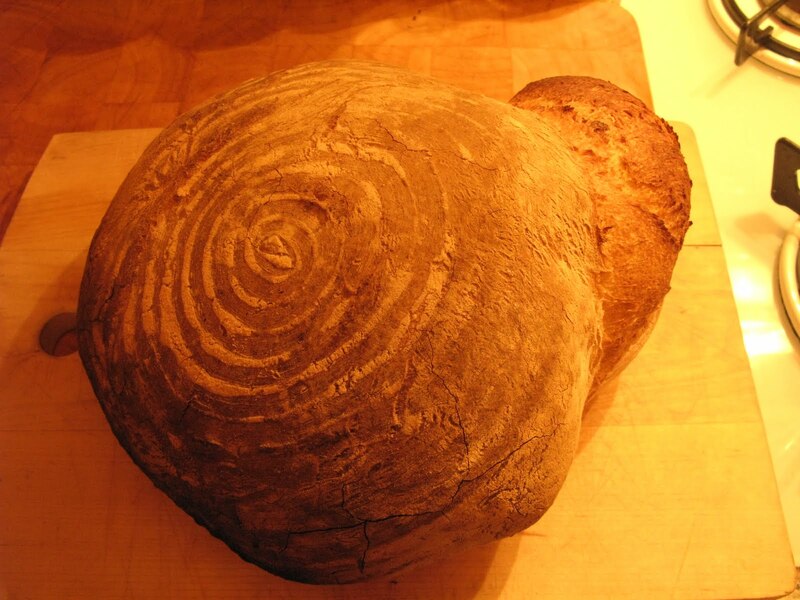 For me, a real treat is to have the luxury of time to bake a loaf of bread or make a cake that I’ve not tried before. I had been looking forward to this day all week. Maybe there was too much anticipation. Anyway, everything seemed to go wrong from the word go. I failed to read the instructions properly when putting my white loaf in the oven, and turned the temperature up too high and didn’t cut slashes in the loaf so the dough could expand properly. What emerged was this bulbous thing, burnt on one side and with a strange protrusion on the other. 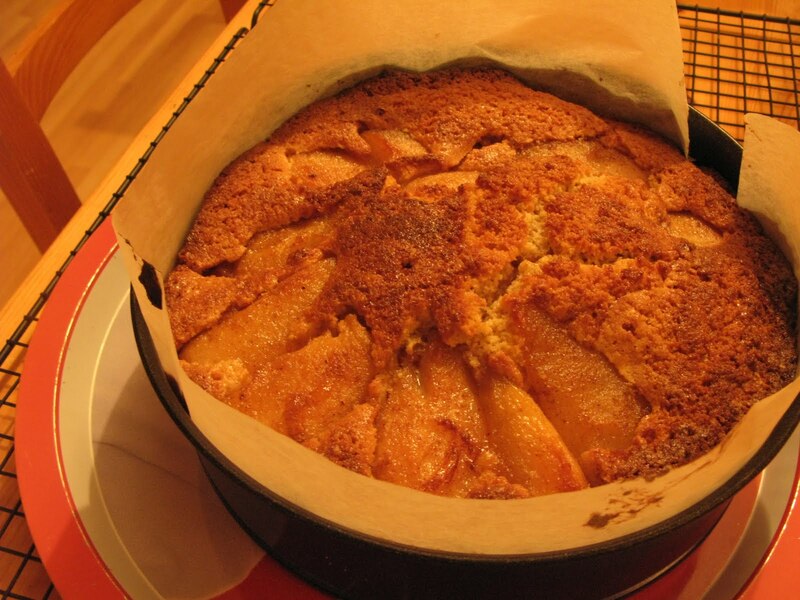 The second disaster was trying to make a pear and almond cake. I had wanted to make one of these all week, after watching Hugh Fearnley Whittingstall whip up this cake in the rustic prettiness of his country kitchen on the new TV series of River Cottage Winter. How I drooled as he tucked into a huge cake with caramelised pears and cream. Lucky bugger. So I wanted to do the same, and found his recipe on the Channel 4 website. I also added a few tweaks of my own (maple syrup to cook the pears instead of sugar, a dash of vanilla), but it soon became apparent that the cake mix that I had assembled was just enough to fill…a tea mug. I scratched my head in disbelief and read the recipe again. Sure enough, I’d followed it correctly. I called my husband in. Cue liberal amounts of sailor-strength swearing and shouting (me, not him). I wanted to throw the sodding cake tin out of the window. Gah! N persuaded me to take a few deep breaths. I was inconsolable with fury. He helped me whip up more cake mix. We had to increase the amounts a further one-and-a-half times. I hurled the damn thing in the oven…and realised too late that I’d forgotten to add any baking powder to the second round of mixture. Guess what, Hugh’s cooking time was wrong too. (Logical, I suppose – you add more mixture, it takes longer). Then the pears started to leak caramel all over the oven. I was almost past caring at this stage. I had to sit down with a glass or three of wine while it cooked. My mood was moribund. Then the cake was ready. It smelt delicious, didn’t look too bad (amazingly it had risen), but by then it was too late in the day to try it. I’ll be trying it today. With cream. And ice cream. So what I want to know, lovely readers, is how angry you get in the kitchen? Do you have tantrums when things go wrong? Is the size of your kitchen driving you nuts? Do you have to stack everything on top of each itself to get to the other side? Please tell me I’m not alone – write below and share your kitchen angst. I need y’all to make me feel better! Ah Charlotte – a relief to know that you make mistakes too, and you're the best cook I know!!! Was the torte tasty underneath its charcoal crust? And did you manage to sneak it past the boss? Kev: meaty risotto – was that a winner? I'm suspecting not…?Nora: I'm glad there's someone else out there who feels her kitchen is conspiring against her! It's amazing how insane it can make you feel, right? And when people come to dinner I sometimes have to instill a 'one in one out' rule in order to remain civil to everyone! Anne, I think the bread looks gorgeous! But yes, I also suffer the occasional 'kitchen meltdown'. Roasts often stress me out – finding that the meat is chewy after you've spent hours hovering around the kitchen. I have often wailed "from now on, we're just having steak!" and vowed never to bother again. Just found this while searching for a pear cake and have added your blog to my list of Must Reads.I had terrible trouble with this recipe. (HFW's, not yours!) I used the original measurements given on the RC C4 website and oh my…it took an hour and a half to (eventually) cook, and it leaked butter everywhere. I was not the only one! The website was aflame. They changed the recipe and deleted all the raging comments. Agas full of melted butter do not smell good, apparently.